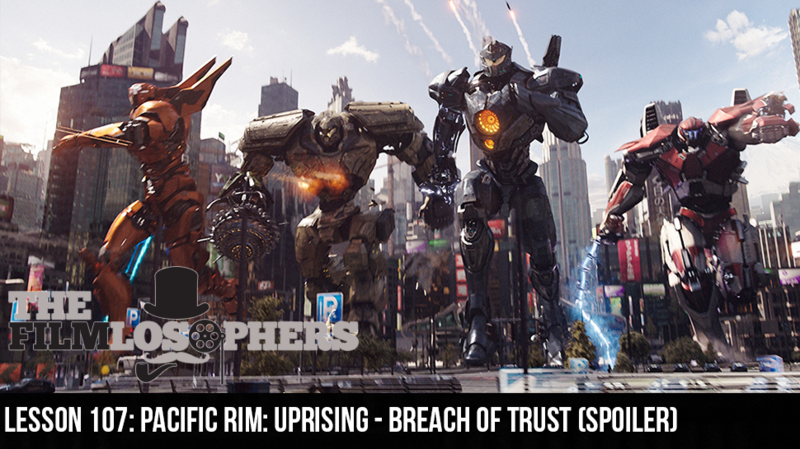 The Filmlosophers, Eddie Villanueva, Chad Riley and Spencer Williams, re-enter the drift – and lose a few brain cells in the process – with this week’s review of Pacific Rim: Uprising (2018). Set ten years after the Guillermo del Toro-directed first film, this installment stars John Boyega as the son of the late Stacker Pentecost (played by Idris Elba) and features only a few returning performers (Charlie Day, Burn Gorman and Rinko Kikuchi). The bulk of the film is devoted to a new group of Jaeger pilot recruits and a small fortune spent on digital effects. With the breach beneath the Pacific Ocean sealed after the first film, one might ask what causes the massive kaiju monsters to return and battle Earth’s building-sized Jaegers once more? The answers might surprise you (or not).